The General preference pane as seen in OS X El Capitan. The basic look and feel of your Mac’s user interface can be customized in many ways. The General preference pane (OS X Lion and later), found in System Preferences, is the logical place to begin. If you’re using an earlier version of OS X, this preference pane was known as Appearance and provided many of the same capabilities. We'll concentrate on more recent versions of OS X, which use the General preference pane to control the basics of how a Mac looks and operates. Click the System Preferences icon in the Dock or select System Preferences from the Apple menu. Click the General preference pane. The General preferences pane is broken into multiple sections. Each section deals with items related to specific aspects of your Mac’s user interface. Jot down the current settings before making any changes, just in case you decide you want to go back to the original configuration. Other than that, have fun making changes. You can't cause any problems by using this preference pane. 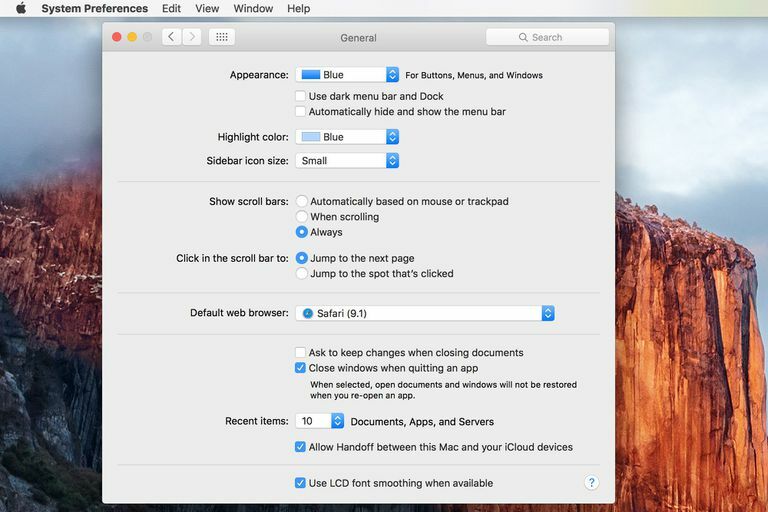 The Appearance and Highlight Color settings allow you to change the basic theme of the Mac interface. You can choose between two basic themes: Blue or Graphite. At one time, Apple was working on an advanced theme management system, but for some reason, it never made it into any of the release versions of OS X. The Appearance drop-down menu in the Appearance preference pane is all that's left of the themes Apple once considered. Blue: This is the default selection. It produces windows and buttons with the standard Mac color scheme: red, yellow, and green window control buttons. Graphite: Produces monochrome colors for windows and buttons. OS X Mavericks added a checkbox that allows you to use a dark theme for the menu bar and Dock. OS X El Capitan added a checkbox that lets you automatically hide and show the menu bar depending on where the cursor is on the screen. Highlight color drop-down menu: You can use the drop-down menu to select the color to be used for highlighting selected text. The default is Blue, but there are seven additional colors to choose from, as well as Other, which lets you use the Apple Color Picker to make a selection from a large palette of available colors. The Appearance and Highlight color section underwent a slight reorganization with the release of OS X Mountain Lion; the Sidebar icon size drop-down menu was moved from the Scroll Bar section to the Appearance section. Since it remained in the Appearance section after the move, we'll cover its function here. Sidebar icon size drop-down menu: Lets you adjust the size of both the Finder sidebar and the Apple Mail sidebar. You can find details about using this menu in the Change the Finder and Mail Sidebar Display Size in OS X guide. The Windows Scrolling section of the General preference pane allows you to decide how a window will respond to scrolling, and when the scrollbars of a window should be visible. Automatically based on mouse or trackpad (OS X Lion used the phrase, Automatically based on input device): This option will display the scrollbars depending on the size of the window, if there's additional information to be displayed, and if the cursor is near where the scrollbars would be displayed. When scrolling: Causes the scroll bars to only be visible when you're actively using them. Always: The scroll bars will always be present. Jump to the next page: This option allows any click within the scroll bar to move the view by a single page. Jump to here: This option will move the view in the window in proportion to where you clicked within the scrollbar. Click at the bottom of the scrollbar, and you'll go to the last page of the document or web page displayed in the window. Click in the middle, and you'll go to the middle of the document or web page. Bonus tip. No matter which ‘Click in the scroll bar to’ method you choose, you can hold down the option key when you click in a scroll bar to switch between the two scrolling methods. Use smooth scrolling: Placing a check mark here will cause window scrolling to move smoothly when you click in the scrollbar. Leaving this option unchecked will cause the window to jump to the position you clicked. This option is only available in OS X Lion; in later versions of the OS, smooth scrolling is always active. Double-click a window’s title bar to minimize: Placing a check mark here will cause a window to minimize to the Dock when the window’s title bar is double-clicked. This is an option in OS X Lion only. Sidebar icon size: In OS X Lion, this option was part of the Windows Scrolling section. In subsequent versions of OS X, the option was moved to the Appearance section. See Sidebar icon size, above, for details. The Browser section of the General preference pane was added with OS X Yosemite and appears in subsequent versions of the OS. Default web browser: This drop-down menu allows you to choose the default web browser from a list of installed browsers on your Mac. If you just installed a browser, you may need to restart your Mac before it will appear in this list. Ask to keep changes when closing documents: Unsaved changes to a document are usually saved automatically when you close the document window or the app that controls the document window. You can change this behavior by placing a checkmark in the box to force the app to ask if you wish for the document to be saved. Close windows when quitting an app: When this box is checked, an app will close all open windows and will not restore the app windows when the app is launched again. Close windows when quitting and reopening apps (OS X Lion only): This is Lion’s version of the 'Close windows when quitting an app' option. It performs the same function; it's just worded slightly differently. Recent items drop-down menu: Allows you to select the number of recent documents, apps, and servers that will appear in the recent items list in the Apple menu. In OS X Lion, there are separate drop-down menus for the number of applications, documents, and servers. Allow Handoff between this Mac and your iCloud devices: If your Mac supports Handoff, placing a check mark in the box will allow you to sync documents and pick up where you left off in supported apps on your Mac and iOS devices. This item appears in the General preference pane in OS X Yosemite and later. Use LCD font smoothing when available: Font smoothing uses anti-aliasing to smooth the edges of fonts; this can make jagged edges of some fonts look better, especially at larger sizes. The font needs to support font smoothing in order for this option to work. Turn off text smoothing for font size: This drop-down menu allows you to select the font size at which font smoothing will no longer be applied. When applied to small-sized fonts, font smoothing can make them look very poor. This option was removed in later versions of OS X since the system and fonts can automatically determine when to turn font smoothing off.